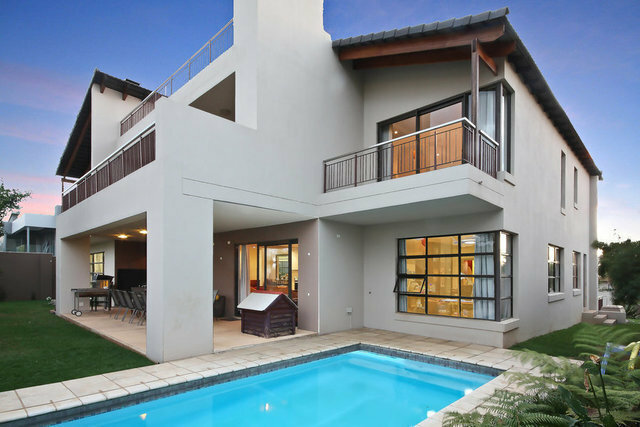 Stunning home in secure Sandton Country Club Estate, overlooking the golf course. Dream home that has it all and more. Huge rooms, perfect for a large family and entertaining. Double volume entrance. 4 entertainment rooms, covered patio, pool and garden. Granite topped open plan kitchen with breakfast section. Guest suite/cottage with bathroom and kitchenette. 4 double bedrooms all en-suite. 2 guest toilets. 2 gas fireplaces. Open patio on 3rd level with 360 degree views. Garaging for 5 cars. Solar heated geysers and pool. 2 large storerooms and linen room. Staff room, kitchen and bathroom + extra toilet.